Friday and Saturday will be amazing days to get outside and enjoy the spring Colorado weather! By Sunday we start to see a change in our weather pattern that could bring more cool and soggy days our way into early next week. Morning – Clear skies and light winds. Afternoon – Mostly clear skies; areas around the Palmer Divide will be in the low to upper 60’s depending on elevation. Morning – Mainly clear with a few clouds, light winds. Afternoon – Showers and thunderstorms possible, gusty winds will be possible. Sunday will start off relatively nice in the morning hours… a lot of areas will see 60’s by lunch time so your best time for outdoor activities will be before 2PM. As we move into the afternoon a cold front is expected to move through, that coupled with moisture and instability from the front means thunderstorms will be possible. By the evening hours and overnight we see continued chances for thunderstorms, rain showers and even a bit of snow depending on your elevation. As of right now it looks like accumulations will be minimal but it will be something we will keep an eye on over the weekend. 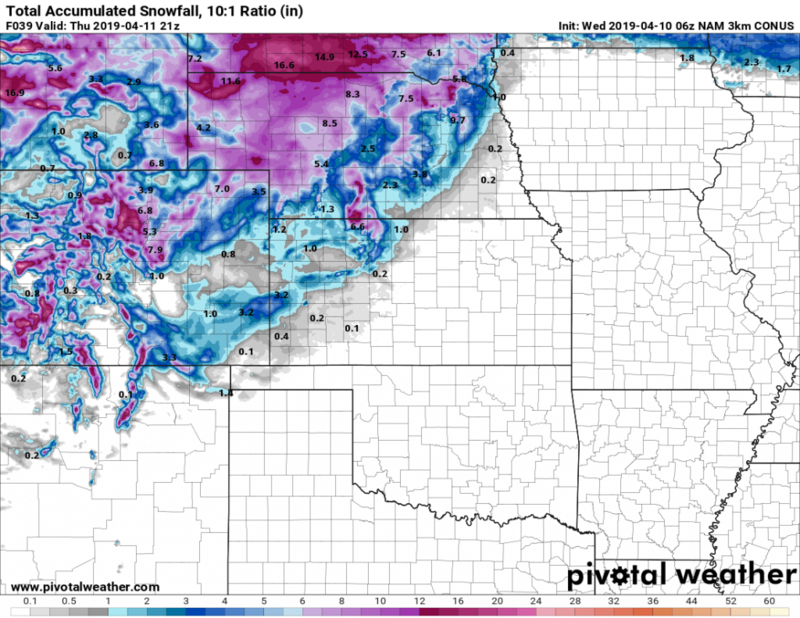 Remember, the front range is no stranger to snow in April and even May! 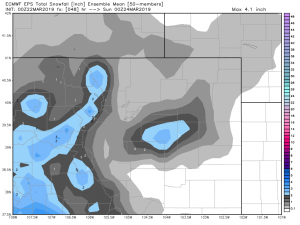 Some models show decent snowfall along the Palmer Divide Sunday night. Nothing to get too excited about as temperatures look warm but we’ll keep an eye on it! Hope everyone has a wonderful weekend and a happy and safe Easter! Not necessarily, I still think we see accumulating snow into the evening and overnight hours. 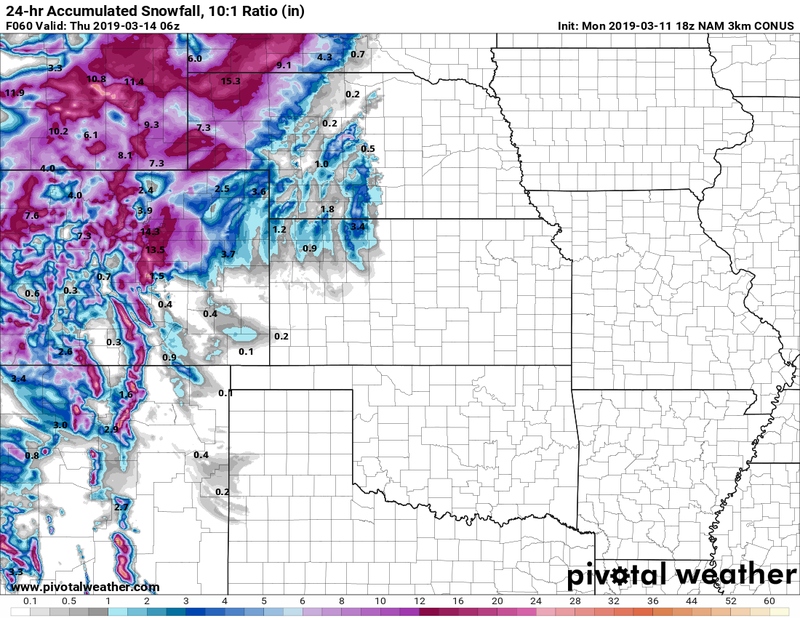 I do think that it will “under-perform” in terms of total snowfall for many areas along the front range and also in terms of blizzard conditions. Interestingly enough, a lot of models are still holding onto the idea of at least some decent snowfall accumulation through the night, but I’m not sure they’re handling what is actually happening too well. Remember, a good forecast doesn’t rely solely on models but a combination of models (and especially once we get closer to the storm’s arrival or in the storms arrival and impact) and incorporating some actual meteorology. Blizzard warnings remain for Northeastern Colorado, Eastern Colorado and the Palmer Divide. 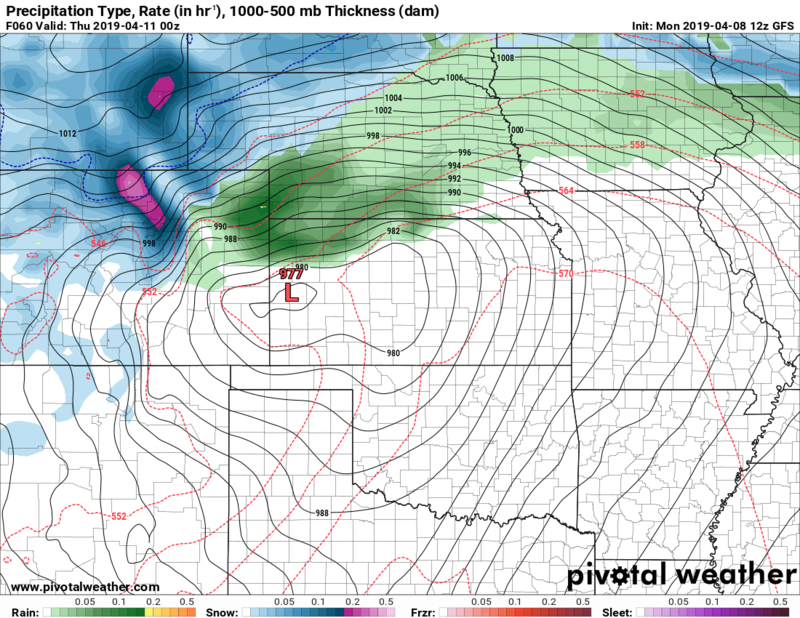 The worst of this seems to be impacting the Northeastern corner of Colorado and into Nebraska and Northwestern Kansas. No word on any changes to these for the I-25 corridor from the NWS and I don’t anticipate they will for at least the overnight hours. So we will continue to keep an eye on this and post more updates if needed tonight. 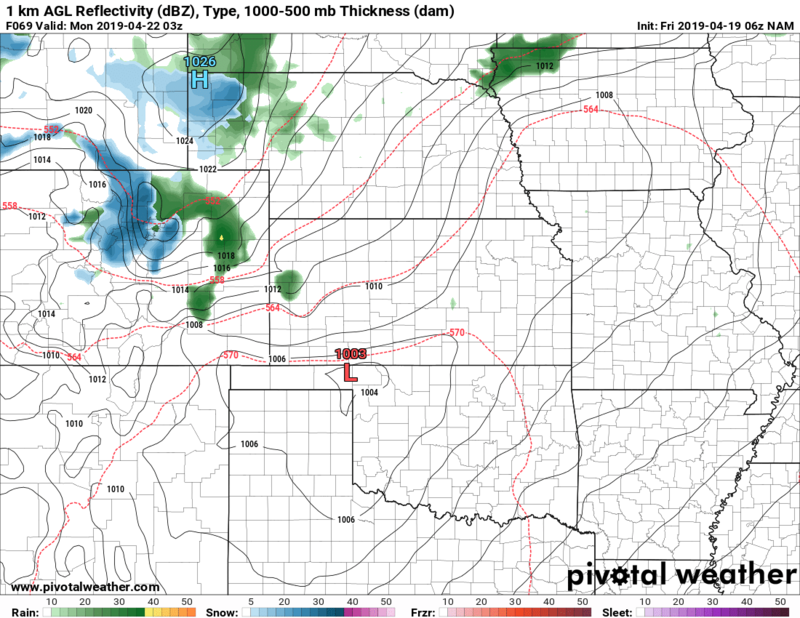 I don’t think this storm will be a total bust but it does look to be under-performing for the Palmer Divide region. Could that still change? Absolutely, but given the data I’ve seen and what this storm is actually doing now that it’s here… it’s looking less and less likely we will realize the severe blizzard conditions that were expected. Unless something drastically changes this will probably be the last full storm update (I may have a few smaller ones here and there on facebook if needed) but I’ve adjusted snowfall totals to the range I think is most likely now and at this point there isn’t really much use in adjusting much more. Hope everyone stays warm and has a good evening! 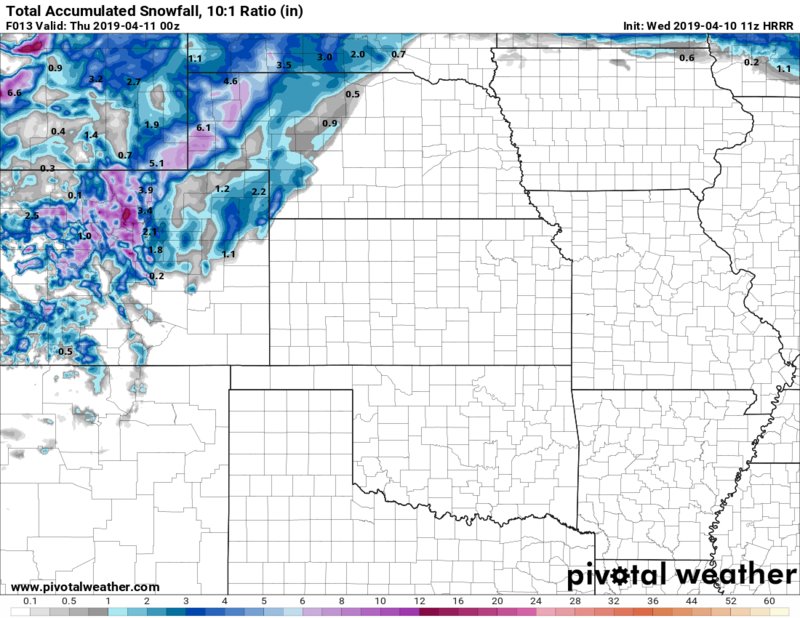 Here’s the latest model runs in this morning, the Nam3k has increased snow significantly and the HRRR seems to verify the higher snowfall accumulation numbers from what we can see of it so far. It’s not completely in range yet, but the fact that it shows a couple inches accumulation by 6pm is good for forecast verification. So far, everything looks on track so we won’t be making a ton of changes to our forecast. Other than a few tweaks here and there, the forecast mostly remains the same. Some areas may see locally higher amounts. Models have pockets of heavier snow for specific areas but it is hard to forecast exactly where those set up. Keep checking back here for changes! Shorter term higher resolution models show a transition to snow after 12 PM, for the Palmer Divide the 1-3 PM time frame looks good for snow transition with snow showing up a bit later in Denver and lower elevation areas. THE COMBINATION OF HIGH WINDS AND FALLING SNOW MEANS BLIZZARD CONDITIONS WILL BE LIKELY… HIGHEST CONCERN FOR TRAVEL RELATED IMPACTS IS EAST OF THE I-25 CORRIDOR AND INTO ELBERT COUNTY. If you do have to travel, take winter survival gear and if you get stranded know that rescue could take a significant amount of time. Everything looks to be a go this morning… I still have concerns about storms like this as the later in the spring we get the more curveball-ish they get. I’ll be watching the temperatures and the storm track especially as any changes in those will have huge impacts for what this storm actually ends up as. Stay tuned, I’ll pass along any updates as needed throughout the day Wednesday. As we move into April and experience warm sunny days, it’s easy to forget that April is our second snowiest month of the year. In an “average” April we would expect to see 9.2 inches of snow in Castle Rock. So far for the month of April Castle Rock is sitting at a whopping 0.0 inches of snowfall recorded. So believe me when I say that seeing a large snow storm in April is not at all unusual! First thing’s first, we have to get through the blast of warmth on Tuesday and gusty winds that will create high wildfire potential. Yes folks, despite a relatively wet late winter, we can still see fires especially when things get warm and windy and our vegetation is still mostly dormant. * Winds...South 10 to 20 mph with gusts up to 30 mph. levels below 15 percent after 12 pm. * Relative Humidity...As low as 13 percent. result in dangerous fire behavior. inches. Winds could gust as high as 65 mph. * WHERE...Portions of east central and northeast Colorado. * WHEN...From Wednesday afternoon through Thursday morning. travel Thursday. Strong winds could cause tree damage. I’ll show a couple of surface maps by some of the models coming in this afternoon. You’ll see a few differences in the finer details but the overall prediction on this system is similar between most of the models, hence why we are a bit concerned about it. Notice there are some differences in the storm track, positions and even timing of the low Wednesday evening. 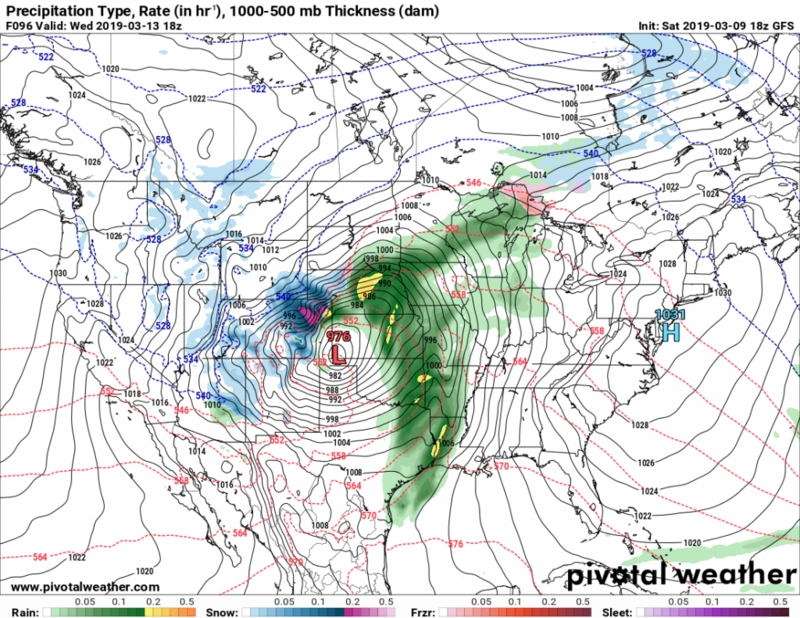 As with most snow related storms in Colorado, where the low sets up and how long it stays there are absolutely crucial. Any wobble can mean the difference between nothing at all or a ton of snow. As you can see, the finer details still aren’t solid enough for us to make a definitive call on how bad this storm will actually be. That being said, the POTENTIAL is there for a large, high impact storm and we will treat it as such. THE COMBINATION OF HIGH WINDS AND FALLING SNOW MEANS BLIZZARD CONDITIONS MAY BE POSSIBLE. We will keep an eye on this and be sure to pass along any information if we start to see Blizzard Warnings issued. So, another spring storm and it could be a doozy. Just like the last, there are still a lot of moving parts and variables to nail down but since this storm has the potential to be high impact… we are recommending folks in the Winter Storm Watch area begin making preparations for blizzard conditions. Please stay tuned to your favorite reliable weather forecast over the coming days and of course we will have plenty of updates here and on our facebook! 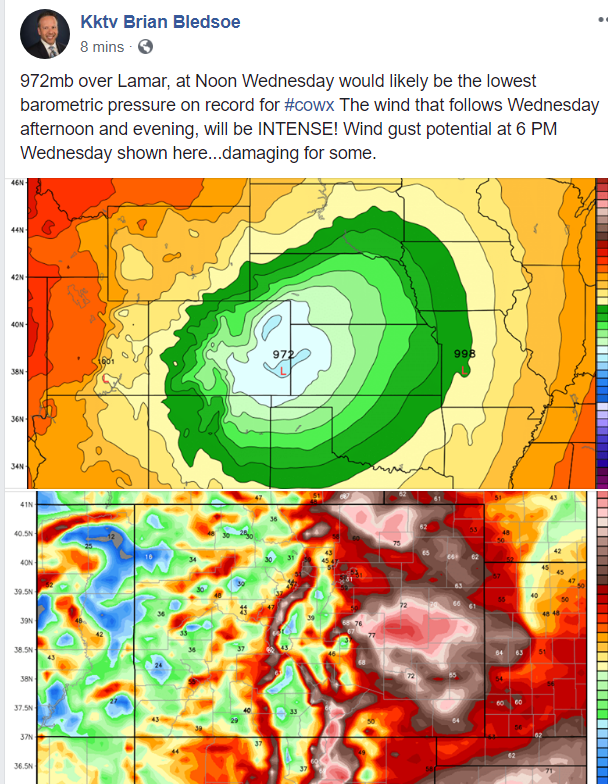 Severe Weather Season is Around the Corner! Time to start Preparing! As many of you know (or not but now you will) Mountain Wave Weather is an officially designated NOAA Weather Ready Nation Ambassador. What does that mean exactly? It means we work with local businesses, residences and everyone in between to be prepared for severe weather. The goal of the WRN Ambassador initiative is to foster innovative, stronger collaborations across government, non-profits, academia, and private industry to help make the nation more ready, responsive, and resilient against extreme environmental hazards. 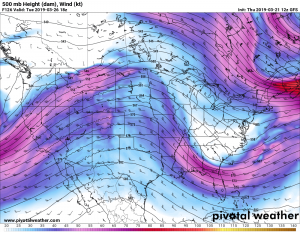 Now that you know, stay tuned for some very interesting articles thorughout the month of April on Colorado’s severe weather, how to be prepared and what to watch for! Safe place selfie at 11:11AM! If there was one extreme weather preparedness action you want your loved ones to take, what would it be? For many, that one action is to know ahead of time where their safe place is located. 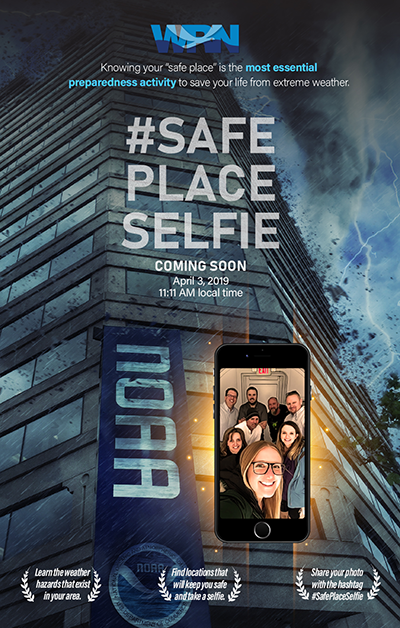 On April 3rd, 2019, at 11:11am local time, please join the National Weather Service and its Weather-Ready Nation Ambassadors to take a “selfie” and post with the hashtag #SafePlaceSelfie. Think about the hazards in your area where you would need to know where safe places or evacuation routes are located. Get creative! Storm shelters, safe rooms, and basements are all good safe places from tornadoes and strong winds, but think of other scenarios or hazards that may require other safe places. What other preparedness actions make your safe place even safer? Having a NOAA Weather Radio? Emergency Kit? Family Communications Plan? I’ll have more information about this up tomorrow here on Mountain Wave Weather with some suggestions based on specific severe weather threats we see here in Colorado. Stay tuned! Lightning Safety – It’s Thunderstorm Season! 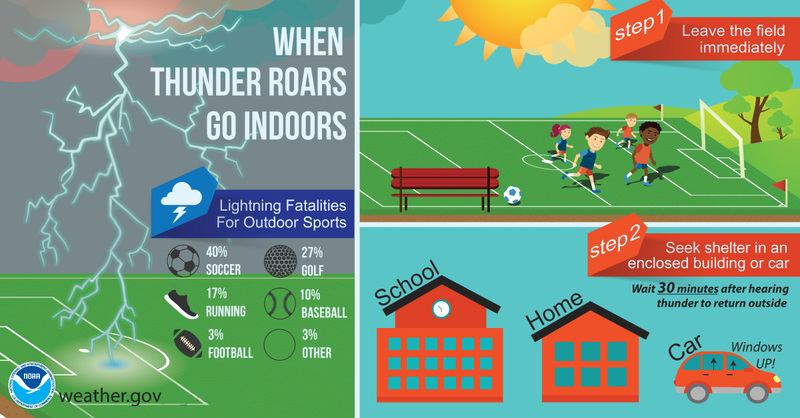 We see the most lightning fatalities with outdoor activities and sports. Did you know Colorado reports on average some of the highest numbers of lightning fatalities in the U.S.A.? We can probably chalk that up to our tendency to be outdoors a lot during the summer, but it also comes down to surprise thunderstorms in the mountains that can often find people in exposed, high altitude terrain with little options for shelter. 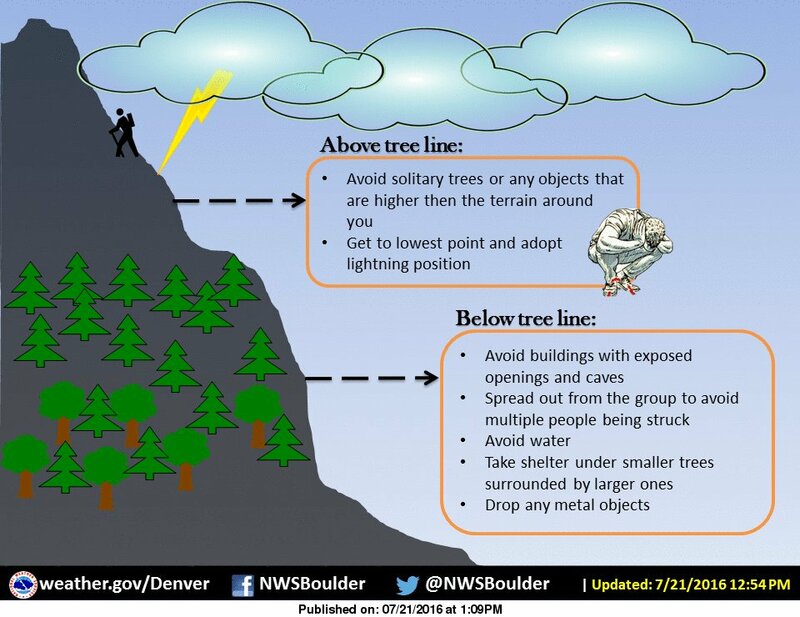 Speaking of which, should you be caught in the hills or mountains and a thunderstorm approaches, here’s some handy tips. If you find yourself above treeline in a thunderstorm, you’re already in a bad situation… but these tips can help a bit. Face it, if you’re in a highly exposed area with no time to get to shelter, you’ve already found yourself in a bad situation. It’s best to pay attention to the weather and make plans to take shelter as soon as you hear thunder. 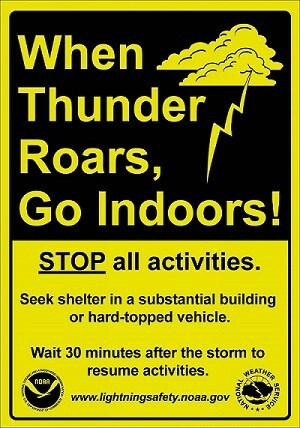 Easy to remember this; when thunder roars, go indoors! If you can hear it… you are close enough to the storm to be hit by lightning! Stay tuned for more severe weather discussion and preparedness tips in the coming days and weeks! Today will feature a large variety of weather across Colorado. The first thing that came out this morning is the Storm Prediction Center outlook and has far Southeastern Colorado under a marginal risk for severe weather. This means that a few storms may become strong or severe but we aren’t expecting a widespread severe weather event. The main threats with a lot of these storms that become strong or severe will be large hail and damaging winds. Hail will be possible with stronger storms along the Palmer Divide but it is not expected to reach severe levels for many areas. The lower atmosphere is simply not going to get warm enough to support large amounts of severe storms. 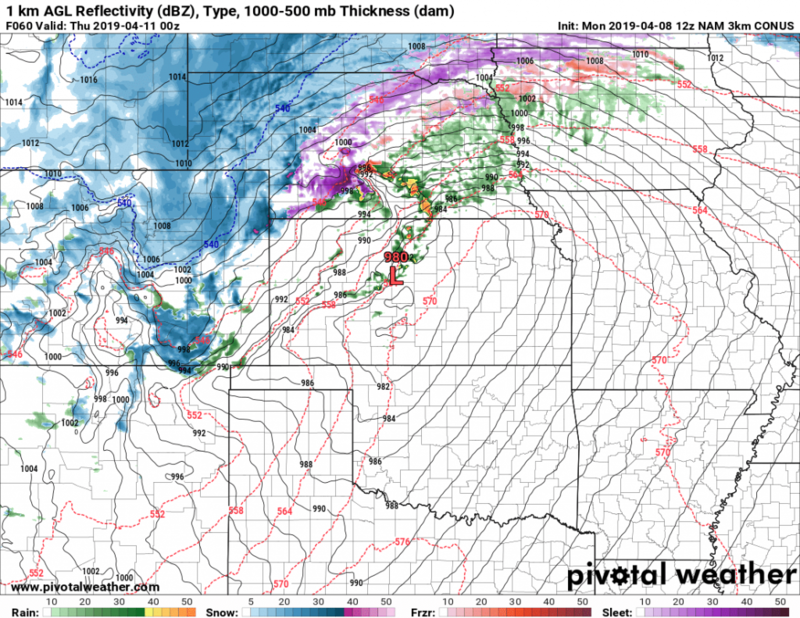 The instability will establish and that will help storms develop with heavy rain and potentially areas of heavy snow. Honestly, this will be a tricky forecast folks. I have a good feeling the models don’t have a decent handle on temperatures and thusly who sees snow and how much of it sticks. I’ll start out by saying from a snow accumulation standpoint this storm looks nothing like the last, temperatures will be too warm for many areas to see decent snow accumulation…even along the higher elevations is questionable. Overnight all snow will fall mainly along the Palmer Divide and especially East into Elbert County. Again, with warm temperatures there is a lot of mixed data on how much snow actually accumulates. Storm looks to begin moving out in the early morning hours of Saturday. Expect clearing on Saturday morning. If I were a storm chaser I honestly wouldn’t be chasing anywhere near Colorado today… even that 2% probability in Texas is marginal at best. Both images above are from around 9PM, but the entire afternoon and evening look similar to everything above. The low level wind shear (0-1KM) is what you look for in tornadoes and there really isn’t much going on near the front range and along the Palmer Divide. You’ll notice the best shear is out to the East of Colorado and South into Texas. Texas seems to see the best chance of severe weather today, Colorado’s is marginal at best… definitely a day I wouldn’t storm chase. There are a ton of other factors to look at when forecasting severe weather, if there’s any interest I may do an article or video on it! So all in all, a tricky forecast. If temperatures trend colder we will see more snow accumulation, if they trend warmer we will see less snow accumulation. I’ll try to do some quick posts on Facebook to let everyone know if I’m seeing anything interesting going in either direction so keep an eye out for that! Euro ensembles estimated snowfall through 6PM Saturday. 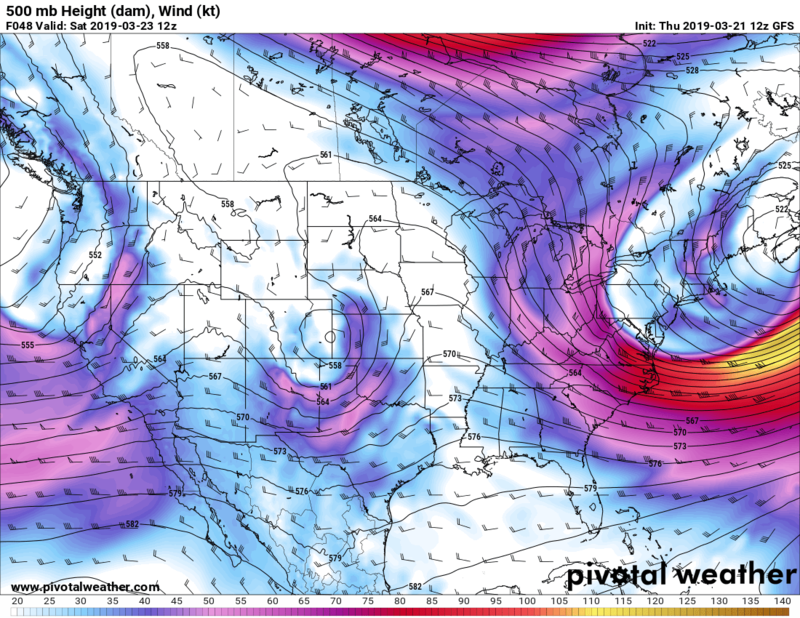 If the Euro’s not excited about a storm… I’m usually not either. The wild card here is the instability in the atmosphere (can produce strong bands of convective snow) and the temperatures. Models don’t always pick up on that too well… even the super accurate Euro. Should be fun to watch! Hope everyone stays warm and dry tonight, looks like a wet and sloppy spring storm, but the good news is nowhere near as bad as the blizzard last week! Spring is Here! All Aboard for the Weather Roller Coaster! For the record, there is no scientific proof or data that we will see another massive snowstorm in the next 7-10 days let alone the season. If that changes we will let you know but right now anyone predicting such a storm is being irresponsible and inaccurate, so keep that in mind! Let’s get back to the fun stuff, just because there’s no “monster snowstorm” in our forecast doesn’t mean we don’t have a decent chance at wet weather for the next week or so. Models have been picking up on this for a few days now, you probably haven’t heard a ton about it because it doesn’t look all that impressive. That being said, we will keep an eye on it because this time of year temperatures can play a big part of what we see out of any storm (in terms of snowfall) and this time of year models struggle with forecasting the temperature/precipitation type link very well. The front end of the storm has pretty decent warm and instability so wouldn’t be surprised if we get the first organized thunderstorms of the year. The low isn’t especially well organized though and the track is not the same as our last storm so we don’t expect major impacts with this one as of right now. As the low moves through and cold air swings aroudn the back side of the storm system, we will see some decent upslope. A setup like this favors the Palmer Divide pretty well in terms of upslope, the big question will be how cold does it get and with that how much snow actually sticks and accumulates? So as you can see, there’s not great agreement on any of these. 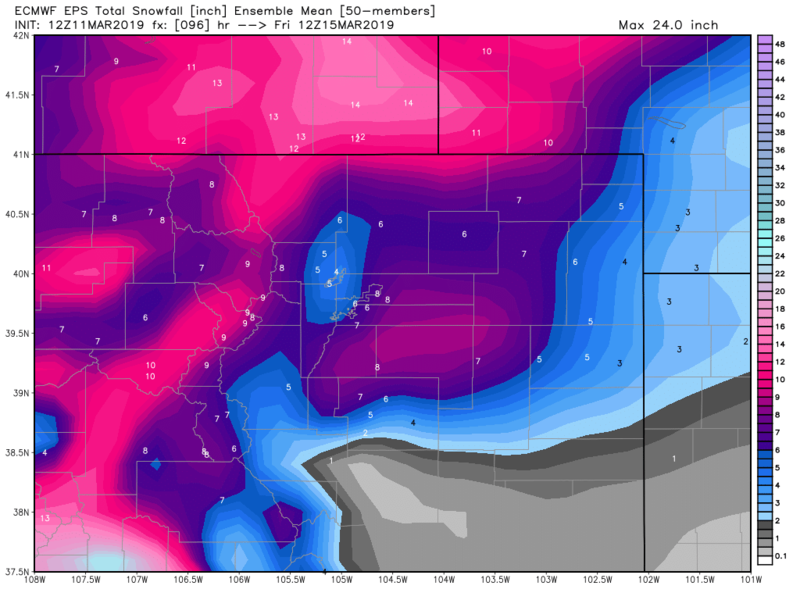 The more accurate Euro model is predicing higher snowfall amounts especially for the Palmer Divide, so we will see if it is picking up on something the others aren’t. You’ll notice the setup looks similar to our “blizzard” storm that we had this week in terms of where this low sets up in Colorado. The big difference is that it is nowhere near as organized and doesn’t undergo any rapid intensification. Bomb Cyclone 2.0 this storm is not! 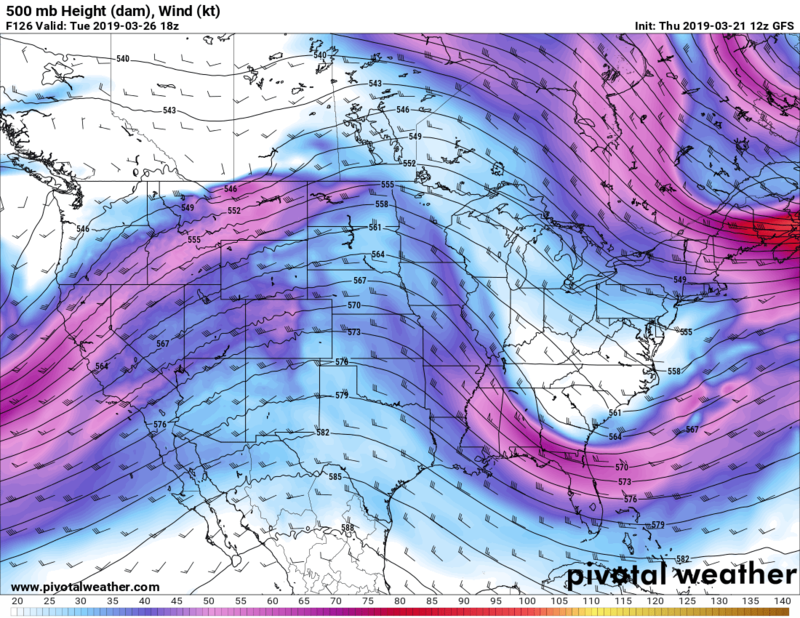 The week sees Colorado largely among “zonal” East/West flow. This generally means mountains continue to see snow as long as storms keep riding that track. For us East of the divide, this usually means we don’t have a good shot at any significant precipitation events. We do tend to see precipitation sneak over the divide on occasion with these setups but nothing large scale. I’d expect a decently nice week with a few shots of light precipitation here and there… wouldn’t be surprised to see some of the warmer days we’ve had in awhile in the middle of the week. 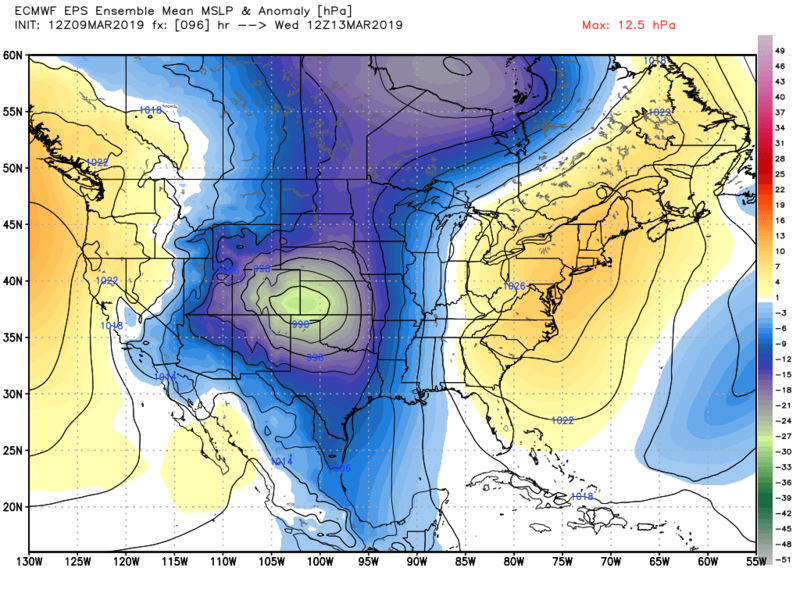 This is one that caught my interest a bit… a pretty strong low pressure system sets up over the plains late next week. This one I’ll be watching throughout the week next week, remember the GFS is horrible on accuracy this far out so while this looks intriguing it’s nothing to fret about at this point in time. Remember, a million little things have to go right for us to see another storm like last week and no model is going to get those details 7+ days out. Looks like a typical spring week in Colorado; decent chances to see thunderstorms, snow here and there and temperatures ranging in the daytime from the 40’s to possibly the 70’s. Buckle up folks, it’s springtime and it’s always a fun ride in Colorado! of 6 to 12 inches expected. Winds gusting as high as 65 mph. 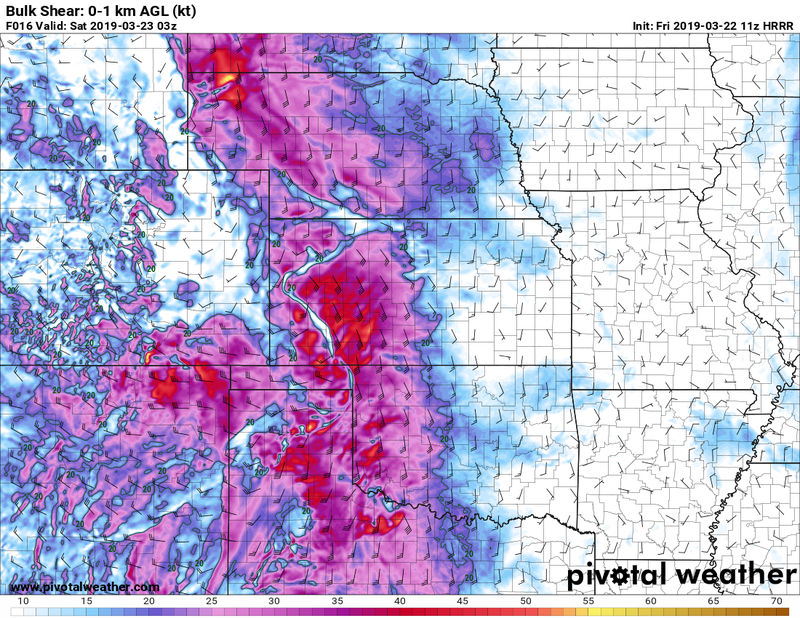 * WHEN...From noon Wednesday to 6 AM MDT Thursday. and result in scattered to widespread power outages. inches possible. Winds could gust as high as 45 mph. * WHEN...From Wednesday afternoon through Wednesday evening. Areas within and immediately surrounding the Blizzard Warning area can expect the potential for road closures, power outages and property damage due to wind. As of Monday afternoon, everything still looks on track with this storm. We are cautiously optimistic that this one delivers a pretty good wallop to the Palmer Divide and NE Colorado. That being said, we will have to watch very closely in case this thing shifts or falls apart at the last minute. That’s something we will be keeping a close eye on through the day on Tuesday. The GFS has been bouncing around on this storm, anywhere from super excited to not expecting much at all. Since this tends to over and under react to a lot of short term changes, it’s something we watch for patterns and shifts but don’t put a ton of stock in just this one model. NOAA’s newer upgraded GFS FV3 (stands for Finite Volume Cubed-Sphere dynamical core in case you wanted to know) is something we like to keep an eye on. It’s still in a bit of a testing phase so I haven’t been able to yet determine its accuracy vs the standard GFS or any of the Nam/Euro models. 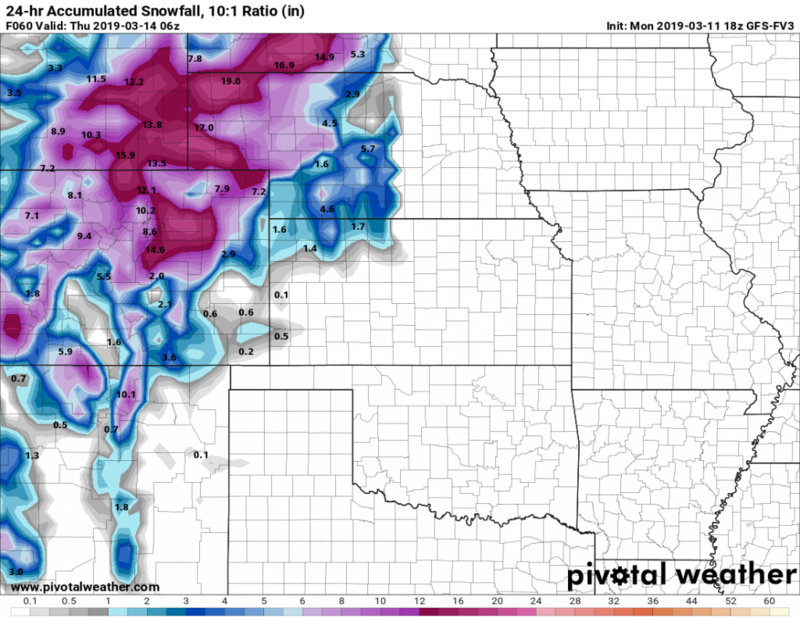 It’s still fun to look at… it’s a lot more excited about this storm than its older cousin. Nam3K is more excited about this storm as well. I love when the higher resolution comes into range as we can start to see some of the subtleties around where this model thinks the bigger snow will be. Finally the EURO, also pretty excited about this storm and one to always watch as it tends to be more accurate than the others. The main drawback is that it only updates a couple of times a day so it can miss short term changes. In a sense, if things set up this could be one for the record books. Some of the models are showing incredibly low pressure in the center of this storm system. In fact, what we see in the pressure with this storm is similar to the pressures we see in moderately strong hurricanes. This is why we are pretty confidence in a high wind event at the very least. Like I’ve mentioned the past few days, hopefully everyone has taken this seriously and made preparations. I’m most concerned about people just East of Castle Rock into Elbert County and points East and Northeast. Is there still potential that this storm does absolutely nothing? Yes, but it’s looking less and less likely. 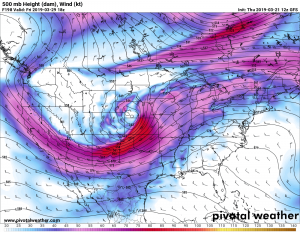 Still we will be watching closely because these big spring storms are often in the habit of throwing curveballs that could potentially upend our forecast completely. 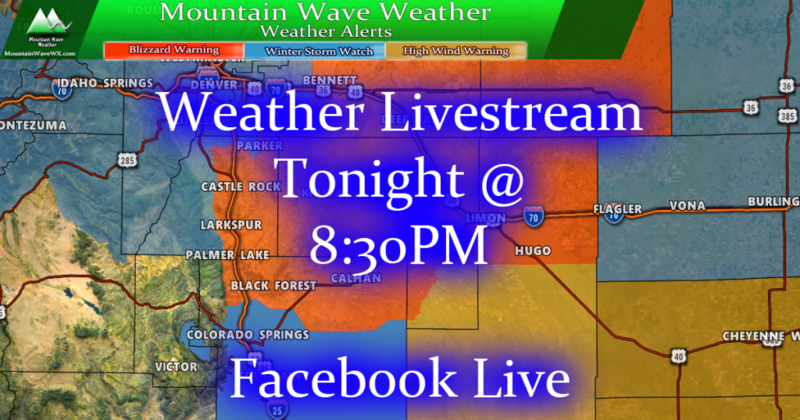 Tune in tonight for a Facebook Live Stream discussing this storm! One last thing, I’ll be doing a livestream tonight looking at some of this information and discussing it. I will also have some updated data to look at and general storm discussion. Don’t miss it! If you’ve followed my site for awhile you know I present the weather very “level-headed” and don’t like to hype things. If there’s a serious event headed our way I’ll let everyone know! That’s why the information below is so important. 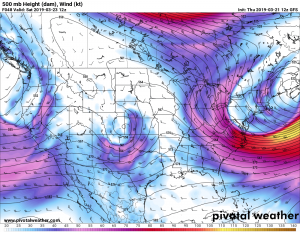 Large Storm Looks Likely… For Someone! 2 of our longer range, higher resolution models have been moving slowly closer to agreement on the setup for a significant storm next week. The GFS and Euro were originally far apart as of yesterday (GFS showing a non-event for this storm and Euro very bullish.) The movement has been towards a higher impact storm across both models, so that increases our confidence in this event. So, a large storm looks very likely. The questions we still have are pertaining to timing, storm track and intensity along with speed. There’s a few variables at play here we just don’t have the answers to just yet. Trying to pinpoint when the worst of this storm will hit is elusive right now. This is to be expected as we are still quite aways out. Suffice to say the impact window is sometime between Tuesday and Thursday at this time. For big snow out of this, we need the storm to stall for a decent amount of time. Too quick and the heaviest stuff will slide to the East, leaving us with little precip and mainly a lot of wind. This something we will have to keep an eye on. 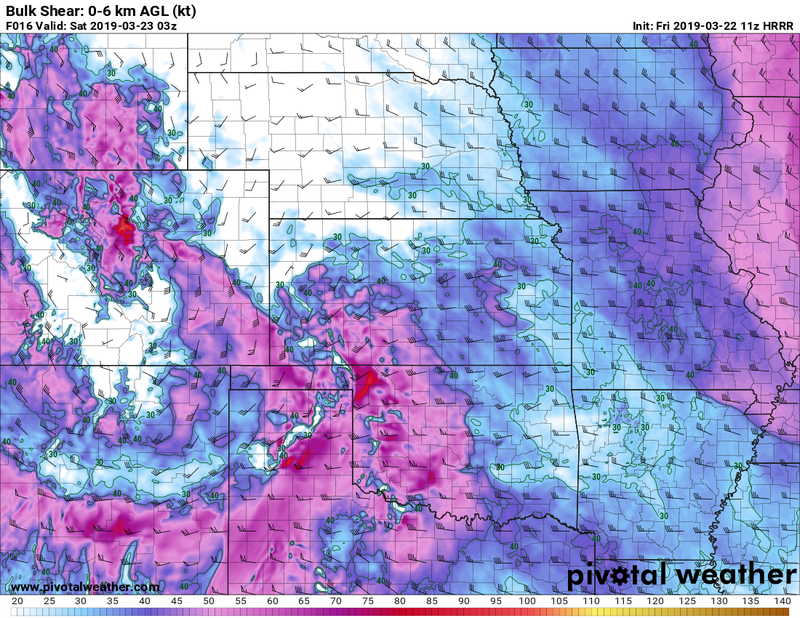 See all those thunderstorms on the GFS image above? Severe weather is likely in front of this storm along the warm sector. If those storms get too big or hang out too close to Colorado, they could rob this storm system of moisture for our upslope. We’ve seen this happen before and it will be something to keep a very close eye on. We can’t get too excited about this just yet because it could fall apart. That being said, we can’t ignore when models agree on a POTENTIALLY HIGH IMPACT STORM. It’s one of those things where it’s better to be prepared in case something does happen than unprepared and caught with a major storm. National Weather Service is a great resource! If you feel like you want to get prepared for this storm; get your errands and shopping done early on Sunday. I imagine the news stations will start to pick up on this and stores will be crowded later on Sunday and especially Monday and Tuesday. **Understand that there is still possibility this storm does nothing… but there is equal the possibility it is a high impact event. That’s why I’m stressing folks begin to get prepared for this! If you have ranching/ag interests, especially in Elbert County. Please begin making preparations for the possibility of a high impact event that could effect livestock. The only changes to the advisories and warnings as of this morning is the inclusion of the Winter Weather Advisory for most of Eastern Colorado. 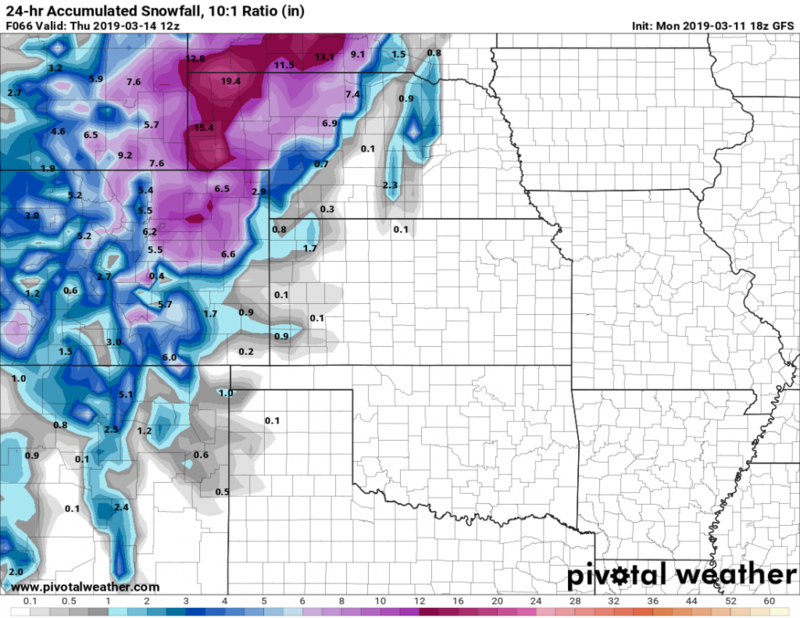 We will be watching this closely, if the NWS believes there is a high probability of over 6 inches of snow accumulation over the Palmer Divide… we may see this upgraded to a warning. You can see Douglas County/ Castle Rock specific weather warning details on our page here. The nice thing about this storm is that this morning we are seeing model agreement (to some degree but we won’t be too picky) for snowfall. Most models fit nicely into our ranges we had been thinking yesterday but with a slight uptick. That information combined with the fact that we are seeing a ton of moisture streaming in and the fact that extremely cold temperatures could boost snow/liquid ratios… we slightly upped our snowfall total forecast for some areas since yesterday. As of the writing of this post, more of the lower resolution models are coming in for the morning and are pretty much staying close to these predictions. So, another interesting day on tap. I’d recommend you finish up your plans and start looking at heading home by mid afternoon. When the snow does move in this afternoon, some areas will see some fast and furious snowfall accumulation so be ready for that! May have one or two more small updates today if things look to change, otherwise this storm is looking on track right now. Stay safe, stay warm and be prepared this afternoon!